I can’t believe it’s already been a year since Jen & Laural opened up goodEGG Industries. Their online shop features the work of emerging and outstanding Canadian designers and makers. As part of the celebrations, they have asked me to host a super exciting giveaway for make something readers. I’m totally honoured and a bit jealous! I just know you’re going to love this prize! 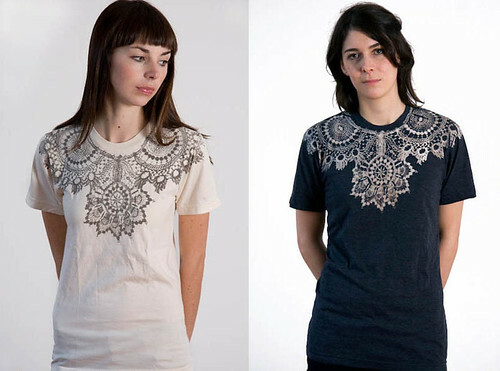 One lucky commenter will win a Lace print t-shirt of their choice from one of their newest designers, Hand and Shadow. The delicate Victorian lace collar design is printed with bleach ink or dark pigment on an American Apparel T-shirt. The designer, Georgie Russell, is based in Vancouver, British Columbia and is inspired by the Victorian era, natural history, scientific illustration – modern and ancient, museum collections, contemporary craft, and textile art. In a shout out to the piles of crafty talent in Canada, goodEGG industries is asking readers to comment on this post with a link (or just the name, if no url is available) to at least one of their favourite Canadian designers to be entered to win. If you are stumped, feel free to check out the goodEGG industries designer profile page for inspiration! That’s not all, they are also offering 10% off your purchases until the end of June for their one year anniversary. It’s the perfect time to treat yourself to something special. I’m so curious to discover who your favourite Canadian designers are! The contest will run for the entire week, ending Sunday June 21 at midnight. The winner will be chosen randomly and announced next Monday. Bazant jewelry rocks; all pieces are created from upcycled vintage material or beads obtained from free trade. The pieces are unique, handcrafted, and beautiful. I love those shirts! Just haven’t had the money to buy one. http://www.coeandwaito.com – they make the most beautiful, delicate porcelain pieces… I especially love their owl lights! http://www.craftdesignphoto.com – Steve builds one-of-a-kind pieces of furniture, using mostly reclaimed and salvaged materials and all-natural finishes. He is also an amazing photographer! their stuff is always so elegant… and they make a great range of products too. One of my favourite Canadian (jewellery) designers is Felixe Carole Dicaire from Montreal- really amazing pieces. So hard to choose! I have so many favourites. I’m going to have to go with Nokomis in Edmonton. Their houseline is so beautiful and their store is gorgeous to boot. I love that they love Canadian designers too. My current favorite canadian designer/artist would have to be Katie Dutton. Her work is fantastic! I plan on buying all three of her Trophy Prints. I love Krecklo designs. Her purses are awesome! For years now, I’ve loved Inder Bedi (Matt and Nat) but I think he was born in England although raised in Montreal…..
Perhaps a more appropriate independent favourite would be Kristy Boucher from Dear Sukie. sooooo cute!!! I heart D a c e. Although now I see that someone else already put that. So…I also love Matt & Nat bags – I’m 90% confident that they are Canadian, too. There’s a furniture designer in Vancouver by the name of Christian Woo. I seriously love his work! one of my favourite canadian designers is erin wilk of anatomy of a skirt. i am really enjoying her current art project robot a day, which you can find here: http://robotaday.com/ if you are having one of those days, just go to the site i am certain that one of her robots will bring a smile to your face! why… i think my favorite canadian designer… and it’s not easy to choose… is anabela of fieldguided! and, i think these tshirts are awesome! i really like those fashioners supayana and iheartnorwegianwood. i forgot they’re canadian until i saw yana’s pict on goodegg’s website! i know they both have etsy shops. I love two designers that are available from goodEGG… Anatomy of a Skirt has amazing purses and bags with innovative designs and plus she is hometown love… and Supayana reccently relocated from NYC to Montreal… I have a few of her pieces and am now happy to know that she is “Canadian” too… Happy Bday goodEGG! Love Astrosatchel’s bags! The applique flowers and branches are just so cool – and they are found on goodEGG! I would own everything on the website if I could! fave canadian designers… so many to choose from. here are three that leap to mind. I would like to second the vote for Bookhou – Arounna and John are awesome. Full disclosure: Arounna was my printmaking teacher at a class at the AGO. For clothing: I love Snoflake – their jackets just fit me really well, and have a bit of pizzazz and Dagg & Stacey – also great jackets. those t-shirts are so lovely! actually, i like a good printed t-shirt and so i’ll say hand and shadow for those great bleach and pigment prints. what a lovely shop. thanks for letting me know about it. Hmmm, my fave designer I would also pick the design genius behind Matt and Nat! My fav Candadian designer right now is Loyal Loot. I want their MONSIEUR DRESSUP so bad. Hmm… there are so many talented Canadian designers, it’s hard to choose. I’ve always loved the delicate porcelain work by coe&waito, and when it comes to anything typographic, Marian Bantjes is definitely tops! my favourite designers are comrags (http://www.comrags.com/). i can never leave the store without buying something. i’m also a huge fan of mercy. i absolutely adore the prints that they use.